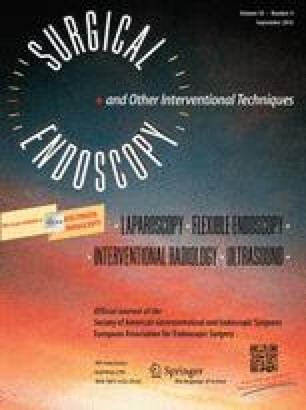 Laparoscopy-assisted distal gastrectomy (LADG) is a treatment method for patients with early gastric cancer; however, single- or reduced-port LADG for these patients has been rarely reported. To compare surgical outcomes of patients with gastric cancer undergoing single-port totally laparoscopic distal gastrectomy (TLDG) to those of patients undergoing reduced-port (three ports) TLDG. This retrospective study included 94 patients with early gastric cancer who underwent single-port or reduced-port TLDG at Samsung Medical Center between May 2014 and December 2014. Surgical outcomes were compared between operation methods. There are more female patients (54.2 vs. 19.6 %, p = 0.001) and less obese patients (21.1 ± 2.1 vs. 24.6 ± 3.2 kg/m2, p = 0.001) in the single-port TLDG group. There were no significant differences in blood loss during surgery, the number of dissected lymph nodes, and the pain score at postoperative first day between two groups. The variance in operation time for the reduced-port TLDG was significantly greater than that for single-port TLDG (p = 0.01). Complication rates in the single-port and reduced-TLDG groups were similar (20.8 vs. 21.7 %, p = 1.000). No postoperative deaths occurred in either group. Single-port TLDG might be considered as a treatment option for a limited subset, such as females or less obese patients with early gastric cancer. Drs. Su Mi Kim, Man Ho Ha, Jeong Eun Seo, Ji Eun Kim, Min Gew Choi, Tae Sung Sohn, Jae Moon Bae, Sung Kim, and Jun Ho Lee have no conflicts of interest or financial ties to disclose.